BJPsych Bulletin prioritises research, opinion and informed reflection on the state of psychiatry, management of psychiatric services, and education and training in psychiatry. It provides essential reading and practical value to psychiatrists and anyone involved in the management and provision of mental healthcare. 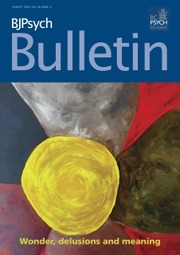 BJPsych Bulletin is an open access, peer-reviewed journal owned by the Royal College of Psychiatrists. The journal is published bimonthly by Cambridge University Press on behalf of the College. There are no submission or publication charges to authors. BJPsych Bulletin is not responsible for statements made by contributors and material in BJPsych Bulletin does not necessarily reflect the views of the Editor-in-Chief or the College.